VATICAN CITY (CNS) — The Ten Commandments given by God are meant to protect his children from self-destruction; they are not harsh rules meant to enslave and oppress, Pope Francis said. Since the days of Adam and Eve, the devil has sought to deceive people into believing that the rules set forth by God are “the imposition of a despot who prohibits and forces” rather than a loving father “who is taking care of his children,” the pope said June 20 at his general audience in St. Peter’s Square. “Man and woman are in front of this crossroad: does God impose things on me or does he take care of me? Are his commandments just a law or do they contain a word? Is God master or father? Are we his subjects or his children?” he asked. Before greeting the crowds standing outside under the sweltering sun, the pope made his way to the Paul VI audience hall to greet hundreds of sick people taking shelter from the heat. “This audience is being held in two places: us here in the square, and at Paul VI hall there are more than 200 sick people who are following us on the big screen. All together, we form a community. Let us greet those who are in the hall,” Pope Francis told the estimated 13,000 people in St. Peter’s Square. While a command “is a communication that requires no dialogue,” the word is “the essential means” of establishing a relationship through dialogue. 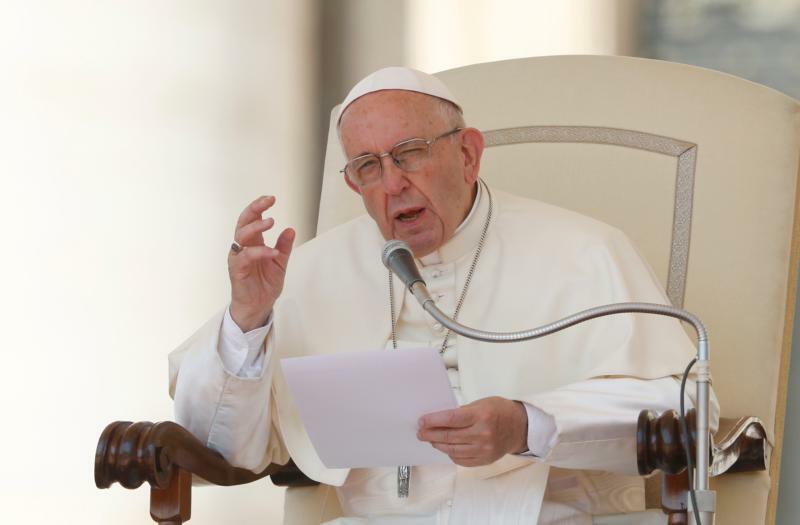 The devil’s temptation of Adam and Eve, which was meant to convince them that God forbade them to eat from the tree to keep them submissive, is a challenge for Christians today who must choose “between a slave mentality and a mentality of children,” Pope Francis said. “The Holy Spirit is a spirit of children, it is the spirit of Jesus. A spirit of slaves can only accept the law in an oppressive way, and it can produce two opposite results: either a life made up of duties and obligations or a violent reaction of rejection,” he said. “The commandments are the path to freedom because they are the word of the father who sets us free. The world does not need legalism, but care. It needs Christians with the heart of children,” Pope Francis said.